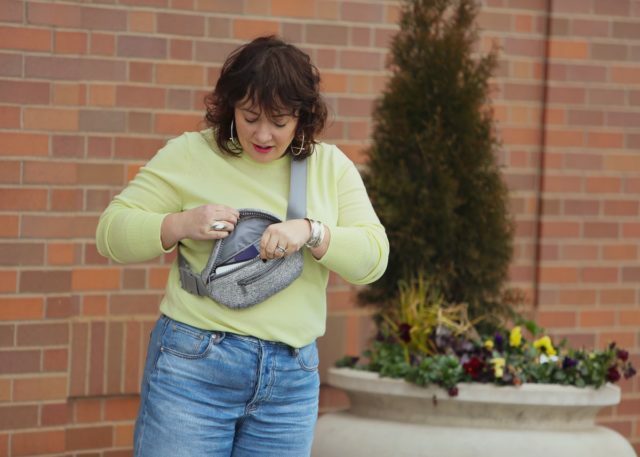 Sometimes I wear a really fun and creative outfit, and sometimes I wear a pretty ordinary outfit to do ordinary things like go to Whole Foods and the dry cleaner. Today you get the Whole Foods look! Everlane recently reached out and offered to send me their bestselling Cashmere Crew in one of their new colors (they now have 20 to pick from). Not normally a color I'd choose, I decided to go outside my comfort zone and pick this color, which is called Citron. I gotta say I like it! It's a very icy color which I find nicer against my skin than a more yellow tone. While I've rocked it with black and navy, this day I went with plenty of pastels. While many of you have raved about Everlane, I haven't featured them before because up until recently, the brand didn't fit me. While their sizing is still limited, at least now they go up to XL or denim size 33 in all their selections. I'll delve more into Everlane in an upcoming post regarding their denim. As for this cashmere, I am impressed for the price. This isn't thick and lofty cashmere, it's about the same weight at my Halogen cashmere but a tighter flatter weave that is less prone to pilling or getting bald spots. And well, it's pretty rare to find cashmere at this price (or most any price) from a company that is transparent about its manufacturing. 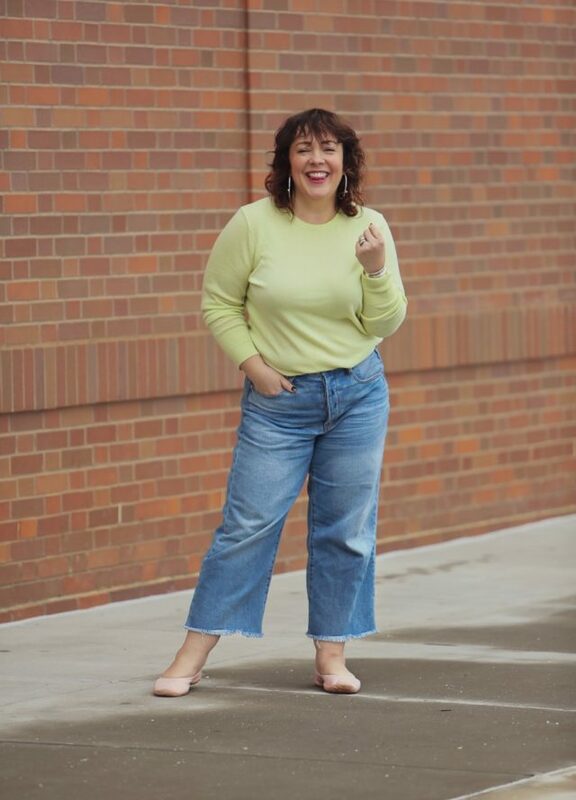 You've seen these jeans before in this post, and if you follow me on Instagram you've seen them again in posts like this one. If you know me in person you've seen me wear these almost weekly. When the weather isn't too rough, I like them with flats, especially my LISSOM Flytes (full review of these shoes coming soon). When it's colder, I wear them with ankle booties and a pair of Smartwool socks pulled up over my calves to stay warm. They've been washed at least a dozen times and this is the third wearing of these before they got laundered again. They have stretched out a bit and aren't as crisp as they were when I got them, but they've still been an amazing buy. 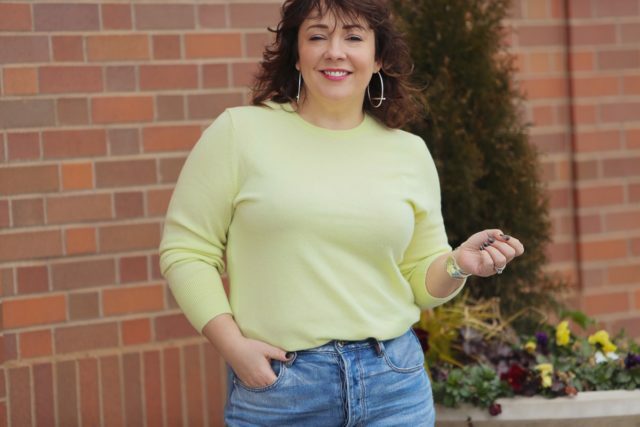 I am truly impressed with American Eagle jeans; they're not just for Gen Z. AE jeans go up to size 20 and have tall and short lengths and their jeans are often on sale (at the time of writing this they were on sale for less than $40). 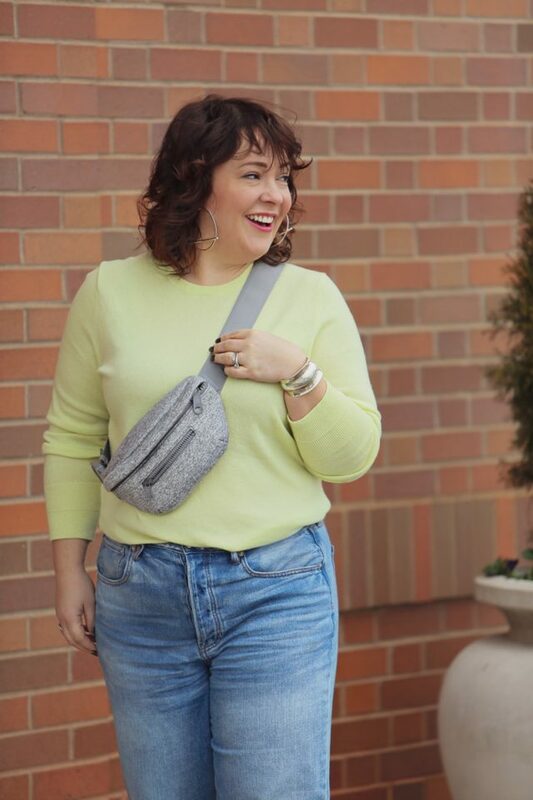 Dagne Dover sent me their Ace Fanny Pack last year and I think it's pretty awesome… but felt a bit goofy wearing it. Like, I'm almost 44, do I look like I'm trying too hard with it? 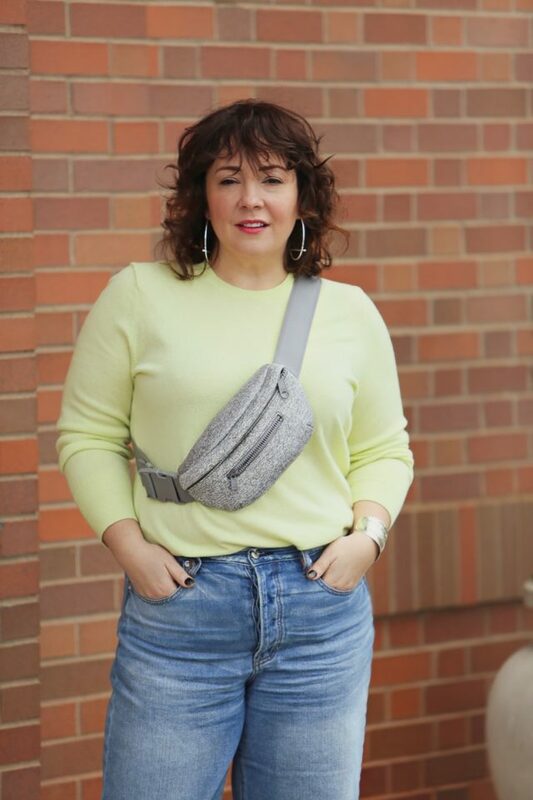 I'm totally fine wearing my leather belt bag, but this felt more trendy. But I saw Dagne CEO Melissa Mash wear hers and it looked clean and modern and ultilitarian and not at all try hard. I started wearing it with a very simple look – turtleneck, slim jeans, boots. But as I used this bag I realized how darn useful a size it is and now it's a favorite. And yes, I do wear it in the trendy Gen Z manner across my body but because it makes sense. At my waist it's often in the way of a grocery cart, my coat, and well, it's hiding where my body goes in and I like that part of my body. But across my body I can reach everything super quickly and it's out of the way. It's also easier to slip on and off; I sometimes end up wearing this over one shoulder like a regular purse! It's perfect for utterly ordinary days like this one. Whole Foods and the dry cleaner FTW! Next Post My Closet Cleanout Left me Without Clothes! Thanks for this post! I’ve been looking for a colorful cashmere sweater and may get one of Everlane’s, as they have a lot of options. I really appreciate that you included the size you took in yours. This would be my first time ordering from them, and while they do have a decently detailed size chart (bicep measurements! ), it’s very helpful to know what you’re wearing and extrapolate from there. Unfortunately Everlane requires a person’s email address or logging into Facebook or Google to look at their products. As it is, folks’ data is spread out in far too many places. What they are doing is akin to asking for a person’s ID before s/he can go into a brick and mortar store. No. I am not going to play as much as I would like to browse their products. I also hate that popup but if you use the X in the upper right corner it will disappear and you can peruse the site. It took me a while to realize this. It may pop up again in a few minutes if you haven’t scrolled around. Thanks Allie. That is helpful. I hadn’t scrolled down far enough and I had missed the X.
I recently bought three pairs of American Eagle jeans and was delighted to discover that they now have *5* length options, adding extra short and extra long to the previous 3 lengths. The styles I was buying came in 5 lengths, anyway I don’t know if that’s the case for all jeans. Oooh that’s AWESOME! Not available on all styles but to even have that option on some of their collection is phenomenal! Ooh, what is that pewter-looking nail color? That sweater looks good on you & just seems like a great piece to have in your closet. I’ve looked on-line at Everlane multiple times but am hesitant to buy. Free shipping/returns from places like Nordstrom’s has spoiled me. I’ve wanted a cashmere sweater for a while now but again, I’m hesitant to make an on-line purchase without an easy & free return policy. As far as your outfit goes, it’s nice to see your normal/everyday clothes! I hear you, I am spoiled by companies like Nordstrom that make shipping and returns so easy and free. But I also know how expensive it is to offer that, and the cost ends up costing us somehow. Nordstrom is a big enough company that we don’t really feel it, but a smaller company if they offered such a feature would cause their prices to rise. But it’s hard to take a risk knowing you will at least be out $6 to ship it back. Oh frayed wide leg jeans, how I’ve missed you! This outfit is #weekendgoals. I can’t get over how much I love the color of the Everlane sweater and it really works with your complexion. 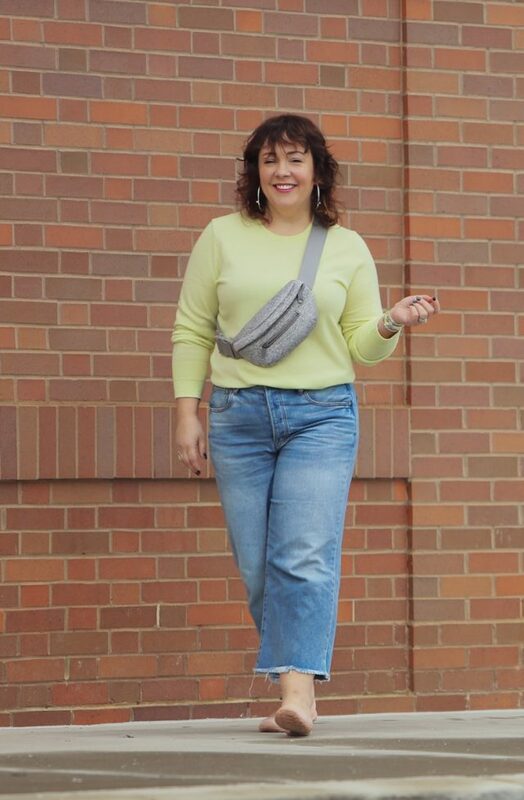 Even the fanny pack, to which I am usually morally opposed, works. LOVE!